There were an estimated 49,000 airline flights canceled in January. About 30 million airline passengers were affected by canceled or delayed flights in January, far more than were grounded by Superstorm Sandy or other bouts of bad weather. Storms during the month cost airlines between $75 million to $150 million, according to an estimate from masFlight, a software company specializing in airline operations. 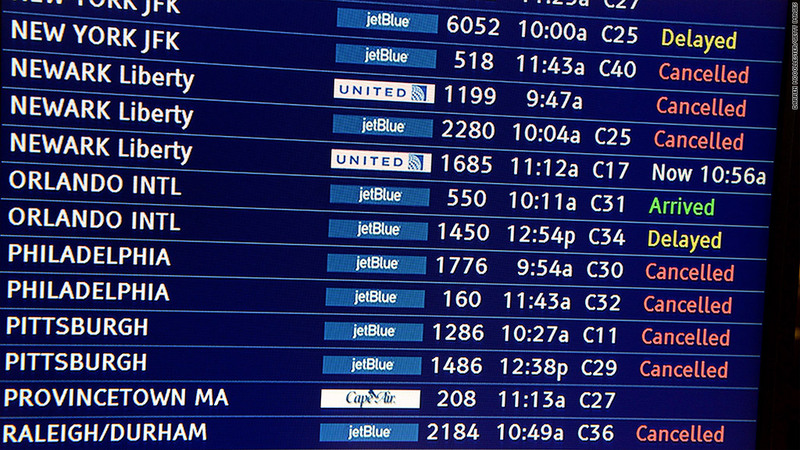 An estimated 49,000 flights were canceled, and another 300,000 delayed. Only about 15,000 flights were grounded by Superstorm Sandy, and about 30,000 flights were canceled by blizzards in February of 2010. JetBlue (JBLU), which has 45% of its flights through New York and Boston, was hit particularly hard by the bad weather, although neither the airline nor masFlight had specifics on weather-related costs for the New York-based carrier. The firm also estimates that weather-related costs to passengers came to $2.5 billion, but that combines both out-of-pocket expenses such as extra hotel and meal costs, along with more theoretical costs such as lost productivity. Relatively new rules that require planes to return to the gate rather than strand passengers on the tarmac, as well as those that limit the number of hours pilots can be on duty, made delays and cancellations worse than they'd been in past storms, according to masFlight's CEO Josh Marks. Josh Marks, masFlight's CEO, said four-year old rules that require planes to return to the gate rather than strand passengers on the tarmac for hours, as well as flight safety rules that limit the number of hours pilots can be on duty without rest, made the delays and cancellations worse than they'd been in past storms. "It takes a unique combination of weather and regulatory issues to have this kind of impact," Marks said. "I think the airlines will get better solving some of the crew issues. These rules have their advantages, but the costs include more canceled flights going forward." Planes are flying at higher capacity now, he added, so there are fewer empty seats to accommodate passengers whose flights have been canceled, which is another factor hurting fliers.